We have huge savings available on coin pusher machines in our bulk offer section where you can save tens of thousands of dollars as we clear our Circle Dome, Dragon Palace and Western Dream machines. Due to space/time restrictions we are selling out our pushers at a huge loss. Please treat the machines as working but definitely need some reconditioning with some plastics to be replaced or hoppers adjusted, etc...and because of the very low pricing we cannot offer any warranties. Inspections are welcomed at our Newcastle warehouse. 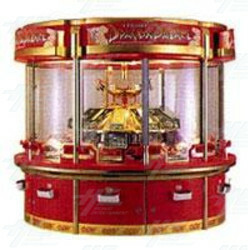 These machines can offer excellent return on investment and are proven income producing machines. Circle Dome, Dragon Palace and Western Dream have been very popular especially in western markets and idea for any arcade centre looking to expand or diversify. Please note these machines are token in / token out style. For more details on the offer please review this link.